You did get the Dry Stone from the fireplace in the cave where the sick dwarf was, didn’t you? Then the rest is easy! Just above Galam is a river going down the left. At one point in the river, it looks a little dented in both sides: this is where you use the Dry Stone . You’ll be able to see the Dwarven Village on the other side, go in there and find the Blacksmith. 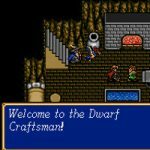 Give him some mithril and he’ll offer to make you a weapon for 5000 (make sure you’ve got plenty of cash!). Some of the more powerful weapons (like the Gisarme) are extremely difficult to get, so I recommend that you save game before asking him to make you something. If you’re not happy with what you get then you can reset and try again (be warned: it could take a long time… on the other hand you might get lucky and get the Gisarme first try!). The smith can do up to 4 weapons at a time, but I always stick to having just one made… if you get one half decent and three rubbish ones then you either lose 3 pieces of mithril to keep the half decent one, or you lose the half decent one and risk getting all rubbish ones the next time (if you get what I mean). After you’ve placed an order with him, leave the village (there’s an exit nearby) and then go back – your weapon will be ready. 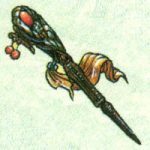 Having said this, some of the mithril weapons can be won in battle or found either in the Deals of a shop or in searchables. A new Theory put forward provides more details, click here to read more! My recommendations for weapon choices are at the bottom of the page. 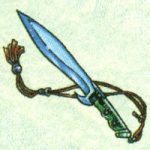 Gisarme NINJ +42 15000G This will sometimes slice the monster in half, killing it instantly! These are the weapons that I would choose for my characters. 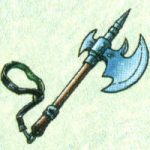 I’ve discovered that the probablity of getting the best weapon from those available for a certain character class is about 4%. The least powerful weapon is about 48%, second least is 26% and the second best is 22%. The chances of getting a better weapon are quite low, so be prepared to spend an hour or more for each character. I didn’t get the Gisarme until I’d tried 27 times! That being said, you may get lucky and get the best weapon on your first try! MMNK Giant Knuckles Really strong! 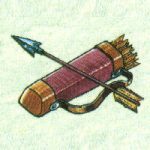 Weapons for Archers, Snipers and Brass Gunners. Weapons for Warriors, Gladiators and Barons. 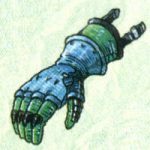 Small but effective weapons for Slade. Weapons for the Ultimate Fighters: Mastermonks! 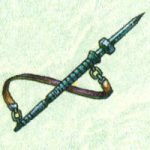 Weapons for Priests, Vicars, Mastermonks, Mages, Wizards and Sorcerers. 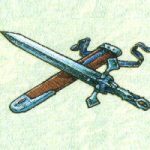 Weapons for Knights, Paladins and Pegasus Knights. Weapons for Swordsmen, Ninjas, Barons and Birdmen. The finest mithril weapons hand crafted for your force by the Dwarven Blacksmith.